I get many calls every week asking what it costs to furnish a vacant property. Clients are often surprised that staging often costs several thousand dollars over the course of 3 months for 4-5 main rooms (living room, dining room, kitchen, family room or office, master bedroom). This is a small investment in creating a model home look that will impress and wow buyers and typically result in a much faster home sale and a higher selling price! In a typical vacant staging, there are 30 to 40 pieces of furniture, rugs, and accessories used to create an inviting model-home look. Then there’s the labor that goes into finalizing furniture selections, dealing with the furniture rental companies, packing up and delivering 2 carloads of accessories for most homes, placing the furnishings, hanging the artwork, unpacking and installing accessories, steaming the bed linens, and packing up everything at the end of staging. 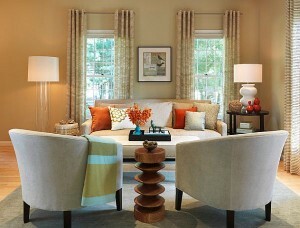 The stager also must wait at the property for two 3-hour delivery and pick-up windows on either end of staging. Tired yet? When the house sells, the stager returns and goes through the de-staging process of coordinating and meeting delivery trucks, packing accessories and putting them back in the warehouse. This is why most busy stagers require at least one to two week’s notice to stage a property and then to de-stage later. As Karen Eubank of Eubank Staging & Design in Texas writes, “No one likes a naked house. People buy homes because they make an emotional connection and that’s very hard to do when a buyer walks into a vacant space. Is it always possible to furnish your listings? No of course not. Sometimes sellers can’t afford it, but when you break down the cost versus return, many of them will have that “Ah-Ha” moment and they will make the choice to stage.